Alphabet Inc. (commonly known as Alphabet, and frequently informally referred to as Google) is an American multinational conglomerate created in 2015 as the parent company of Google and several other companies previously owned by Google. The company is based in California and headed by Google's co-founders, Larry Page and Sergey Brin, with Page serving as CEO and Brin as President. The reorganization of Google into Alphabet was completed on October 2, 2015. Alphabet's portfolio encompasses several industries, including technology, life sciences, investment capital, and research. Some of its subsidiaries include Google, Calico, GV,Google Capital, X, Google Fiber and Nest Labs. Some of the subsidiaries of Alphabet have altered their names since leaving Google - Google Ventures becoming GV, Google Life Sciences becoming Verily and Google X becoming just X. Following the restructuring Page became CEO of Alphabet while Sundar Pichai took his position as CEO of Google. Shares of Google's stock have been converted into Alphabet stock, which trade under Google's former ticker symbols of "GOOG" and "GOOGL". This is going to weigh heavy on the markets tomorrow, MSFT, V, SBUX..
Will its stay at #1 last longer this time? AAPL's market cap will eventually bounce back up, but GOOGL's might bounce more, I think. We’ve taken seriously the concerns in the European Commission’s Statement of Objections (SO) that our innovations are anti-competitive. The response we filed today shows why we believe those allegations are incorrect, and why we believe that Google increases choice for European consumers and offers valuable opportunities for businesses of all sizes. We believe that the SO's preliminary conclusions are wrong as a matter of fact, law, and economics. We look forward to discussing our response and supporting evidence with the Commission, in the interest of promoting user choice and open competition. Well, for that they will be getting the biggest fine ever from the EU/EC. Three times bigger than either Microsoft or Intel got. Legal sources said the fine it faces over shopping comparison is likely to take account of the fact that Google abused its monopoly on general web search over many years. The European Commission may also seek to make an example of the company over changes to its algorithms during the investigation that made it even harder for competitors to thrive, as well as what some officials now see as its delaying tactics during the investigation. Said from the start that Google should have bent over backwards to comply with the EU. Europe is not like the US; if you challenge them and fail, they can seriously hinder a behemoth company. Look at 10 year charts of MSFT and INTC. And Google's fine is going to be 3x as big, and they will have to change their algorithms if they want to keep doing business in Europe (duh, of course they want to). More music was consumed in all sorts of ways, from streaming video and audio to good old-fashioned vinyl. There was just one problem - money earned from sales and streaming actually fell. And the industry knows who it blames - YouTube. An 82% rise in the number of audio streams saw revenue from this source soar by more than two-thirds to £146m. Meanwhile, video streams increased at an even faster rate - but revenue rose a mere 0.4% to just £24.4m. The BPI said that was even less than the industry earned from vinyl sales last year. For its chief executive Geoff Taylor, the message is clear: "Music is helping to grow YouTube's business but they are not sharing that value with its creators." But most of the music on YouTube is there because it's been uploaded by Vevo, a company created by the labels for that purpose. So isn't the problem that the labels have simply negotiated a poor deal with YouTube's owner Google? Would be really disappointing if YouTube got hamstrung as a service that provides easy access to media. I don't think it will get that bad, but at the least I think YouTube will have to start paying a larger percentage and only keep a smaller share of the money for itself. I agree about what's said in the article about labels taking their contracts with YouTube lightly. I wonder how it's all gonna end. Pretty sure there's no legal issue there and considering that the labels are as dependant on Youtube as it is I think some hard talks are going to take place. If any at all, of course. 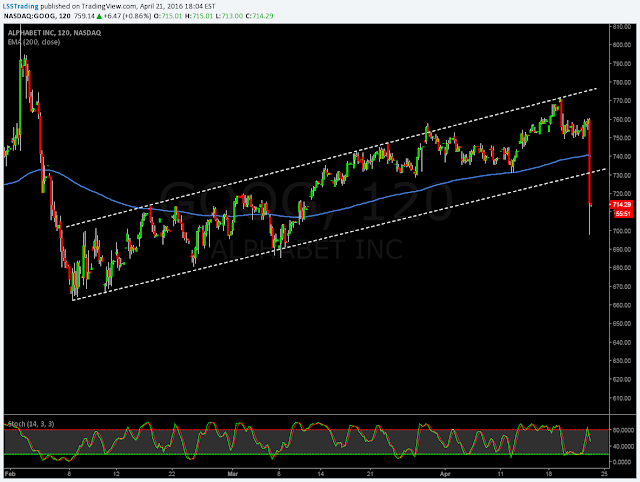 Another GOOGL chart I did. Only question is will it get thru 736/737 early w/volume. If it does $741-$744 quickly. Looks like $800 is going to be Google's new floor.